The best medicine is preventive. Judaism teaches the importance of purity in thought, speech, hearing, sight, and deed. A child learns and lives. What he hears at home and by the media will train his or her thought patterns. Provide them with purity and Torah they will live pure lives. One of our jobs as parents is to teach our children in such a way that their souls will remain as pure as when they were born throughout their lives. We are guided to that goal through the teachings of Torah. And by imparting it to the children through the teachings of Torah – through learning it together with them, sending them to Torah day schools and bringing them up in a home conducive to Torah and Mitzvot. Protecting thoughts from impurity does not only apply to children but to ourselves. Unfortunately many marriages were broken due to social media, improper usage of internet and smartphone apps. Someone said – before the street was the street and the home was the home. With the TV – we bring the streets into our home. Even more so with the internet. We thus provide a list of ways to protect the home and family from improper usage of the internet. The best way is to limit technology. Use a flip phone instead of a smartphone, but if the pros outweigh the cons of having a smartphone – we provide some simple methods of protection. To protect one has to have a rudimentary understanding of technology. If one is not so tech oriented – perhaps they can take counsel with tech protection organizations – like smartconnectionsny.com. Here is some basic info about technology. The internet is basically one computer “talking” to another computer. To gain access to internet – one uses a modem or router as the device that allows the computers to communicate. Let’s add three more elements : The browser, protection program and the Cloud DNS. The Browser – like Chrome, internet explorer, firefox or safari is a program that enables the computer to interpret the other computers information. They usually communicate with a language called HTML. The browser can prevent pop-up ads and also other improper material. Some browsers allow extensions or add-ons to be downloaded and incorporated into browsers that can help you in your parental control quest. 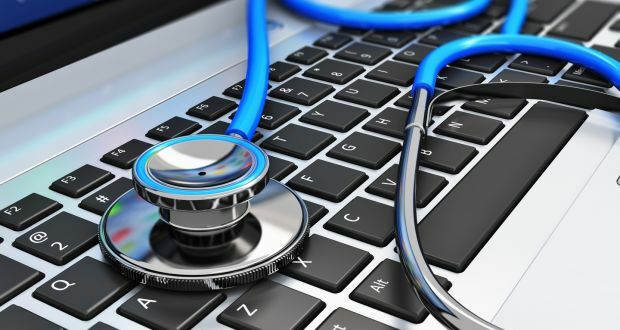 The Protection Program – this program that is on the home computer that protects the home computer from threats – like spyware, viruses, root-kits, trojan horses, malware, and inappropriate information. The threat protection programs include include windows defender, spybot search and destroy, ZoneAlarm, Comodo Firewall Pro, Avast, AVG Anti-Rootkit, Spyware Blaster, AOL Active Security Monitor, McAfee SiteAdvisor, LinkScanner Lite, McAfee Total Protection, McAfee LiveSafe, Bitdefender Internet Security, Symantec Norton Security Deluxe, Kaspersky Internet Security, Webroot SecureAnywhere Internet Security, Kaspersky Total Security, Bitdefender Total Security, Symantec Norton Security Premium, Trend Micro Maximum Security, and others. Some are free for basic services. Some include parental controls others do not. Some protect against websites sites include k9. Social media sites are sites that allow people to communicate with one another for the sake of socializing through computers. Many exist. Recognize how one’s children are using the social media may provide info on whether the social media is a positive benefit for their kid or is it a negative influence. Are they using it properly or is it helping them to go down further in morality. Parents may ask questions like – does my kid really need a cell phone 24 hours a day? Do they need a smart phone? How are they using social media? Do they need 24 hour internet access? Do they need access to certain apps? Do children lock their doors for periods of time? Does the Wifi have to be on all the time? I like google. They help us find info. Chrome is a good browser. But it may be too good. It has a mode – like internet explorer and firefox – called private browsing or incognito mode. This feature allows people to surf without a trace of what they did. great for kids that don’t want parent to find out where they surf. I tried to disable private mode in Chrome. One article gave 28 steps on how to do it. A bit too many steps for me. apparently you have to do the reverse to reinstate it. I just decided to uninstall it. Some browsers on the computer or smartphone or tablet are made to protect from inappropriate sites. Here are some tips to prevent children from accessing sites you don’t want them to be on. We will include a gamut of ideas – some extreme (more secure) to less (less secure). Caveat – remember to write your passwords in a secret place but accessible by you in case you forget. The List below includes many ideas – i am sure there are more – and some are repetitive but may be phrased differently to gain a better understanding. 1. GN: Do not use or allow use of a internet, computer, TV, smart phone or tablet for kids or adults. 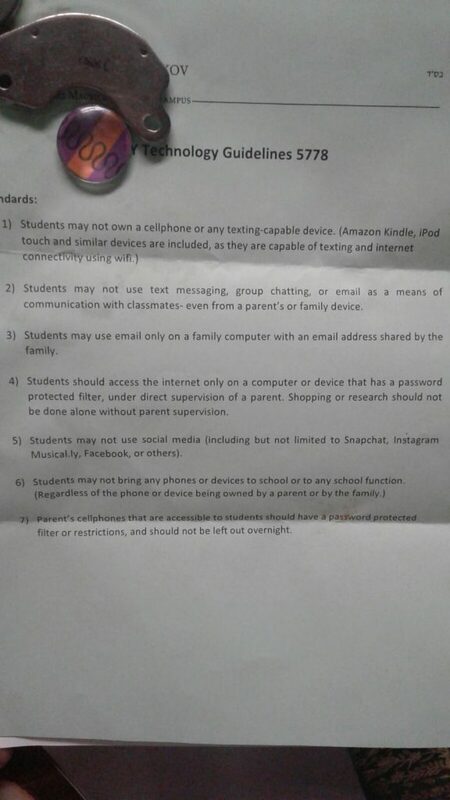 (Our school has a policy that students are not allowed to use internet or smart phone). Rid yourself of devices that capture internet or at least minimize them. 2. RT: Do Not install internet service at home. 3. PH: Rid yourself of your current and/or old (and others) smartphones. Old smartphones can capture internet as well. Use a flip phone instead. 4a. RT: Use an internet provider that already filters the internet. 5b – Restrict Access to programs on computer or phone. For iphone: it is easier to secure than an android. Some people buy specifically iphones because it has stronger parental controls. Use “settings” to lock access to apps. A special app has to be downloaded to lock apps on an Android. Search apps called “applock”. on an android lock the settings for 2 reasons – 1 to lock the access to children using the Mobile Hotspot. 2 To block children from. One produced by Cheetah – called CM applock on android allows a password on selected apps. It also takes pictures of intruders who tried to access the program – but entered the wrong password. Lock access to using browsers like chrome or other browsers. 6. RT: Use a service called OPENDNS – found at opendns.com that protects the router from inappropriate sites. 6a RT: Disney offers hardware that is called “circle” that protects family from improper internet usage for about $90. (see meetcircle.com). There is another hardware called koala as well. 7. RT: Turn of wifi – when not using it. change password to wifi regularly. 8. CP: Install Internet filters. – Like K9 (http://www1.k9webprotection.com/) on your devices – iphone. 9. MH: Disengage – mobile hotspots. A mobile hotspot allows a person to access the internet through a smart phone. To get around wifi restrictions – Children can borrow phone and use moblie hotspots for wifi. Put a password on the mobile hotspot application (with an applock program) or buy a phone or service that does not offer it. Note: the mobile hotspot app may not appear in the applock locking app list of programs. In that case one must lock the settings. 11. CP: change your administrative and system password to your boot up system of computer. for windows based computers – one usually presses f2 or f12 when booting up system. 12. CP: remove the ability to boot up your computer with a usb or cd drive. some can bypass filter by using a USB key with another operating system. 13. AP: Check browsing history regularly to see if there are any inappropriate sites that were accessed. 14. AP: Use only browsers that you can disengage privacy mode or incognito. Incognito mode or secret mode allows a person to surf the web without being recorded in the history. a program called incognito gone (for windows) (http://incognitogone.com/) allows you to remove incognito mode in several browsers. in order to do it manually see articles below. If you are experienced making changes to your computer’s Registry, you can permanently disable the “In-Private” browsing function so that it cannot be turned on by user settings. If you have never done this, DON’T TRY …………get someone you trust to make this change for you. 16. GN: Teach children the dangers of inappropriate material. 17. GN: Learn about punishment for releasing seed in vain. 18. GN: Split the password. Husband knows one part of password and wife knows other. And they don’t tell each other their own half. 20. GN: be in touch with technology hotline. one is called (http://www.smartconnectionsny.com/) They can help you secure your technology for free or a very reasonable fee. 21. AP: In email filter out certain words to send immediately to trash. 23. CP: Parental filters on mac or windows to prevent usage of computers at certain times. 24. RT: Restrict / Block all computers from your router except for the one(s) you use. Restrict Time of usage. This is done by logging on to router – see the particular router’s instructions. 25. GN: Use internet only for business. 26. RT: Don’t use wifi. If Kids want to use computer let computer be in a place where there are people who pass by. or limit Wifi by turning it off at certain times. Restrict time of computer usage. Only allow certain computers to log on to your router. 27. GN: Learn Torah Laws of Yichud / Seclusion – apply to computer. Put the computer in a public place where people come in and out to prevent people from doing things in secret. I once asked the Helper of Rabbi Elyashiv about Internet Usage. He said – it should be only used for business – and it should be treated with the same laws as Yichud. 28. GN: Think of futility of sites – it only makes you feel badly afterwards. 29. GN: Think of the day of death. Pirkei Avot. You will be judged and everybody will see your activities on a big screen in heaven. 30. GN: Send your activity by email to a trusted person through program like k9. 32. GN: Observe Laws of Tzniut / Modesty. 33. GN: Be wary of friends of kids that are techies that steer your kids to bypass filters. 34. RT: Don’t show your wifi name publicly. On router administration panel one can choose that the wifi name not be displayed publicly. Change the name and password of the wifi access regularly. 35. RT: Assure your neighbors don’t have open usage wifi. or ask them to not give password to your kids. 36. RT: disengage wifi router button – called WPA. 37. CP: on tablets and macs – set up app access carefully. 38. GN: See if there is suspicious activity on your computer. Like – if you finished using one program and then when you log on you find another program running. Or if you use only a small amount of data on your phone and you see a lot of data being used. (see settings – data usage). If your google search brings up previous searches with improper words – be wary. Some AppLock or AppBlock programs take pictures of intruders. 39. PH: Clean your phone window – to prevent children finding out phone passwords. Children can guess the swipe code based upon finger prints on window. 44. AP: Install web browsers with reporting features – like webshadow. 49. AP: Don’t use multiple browsers or browsers that have privacy / Incognito / Secret mode. Privacy mode – allows a person to browse without websites being logged into history. Some browsers allow a password to be used to engage privacy mode. Put on a password on privacy mode. 50. GN: Monitor the data usage of your applications on your phone. If you notice that mobile hotspot is using a lot of data and you don’t use mobile hotspot – perhaps someone in your family is using your phone. On android – go to > Settings – data usage – see which applications are using much data. 51. CP/PH: An Apple Iphone is more able to be secured from unauthorized access (without using external programs) than an android phone (i speak about the android version 5 – i don’t know about the newer versions). It has parental controls built into the operating system. Android has a program called “Family Link” (which works on Android 7.0 Nougat). On the device you want parental controls on, open the Play Store app . In the top left corner, tap Menu Settings Parental controls. Tap the type of content you want to filter. Choose how to filter or restrict access. 53. GN: Children learn from parents. Limit your own technology usage to set a good example for children. 54. GN: Be on the same page with your spouse regarding tech usage. At times one spouse wants to be more restrictive while the other wants to be less restrictive – discuss what is important together. 55. GN: Install programs, apps and browser extensions that enhance parental control. 56. GN: Make policies at the house – no internet before homework. No usage after 9:00 pm or before 7:00 am. Some can be assured through router settings. Enforce them. 57: GN: Work with School to make and enforce policy. Here is an example of a school policy. 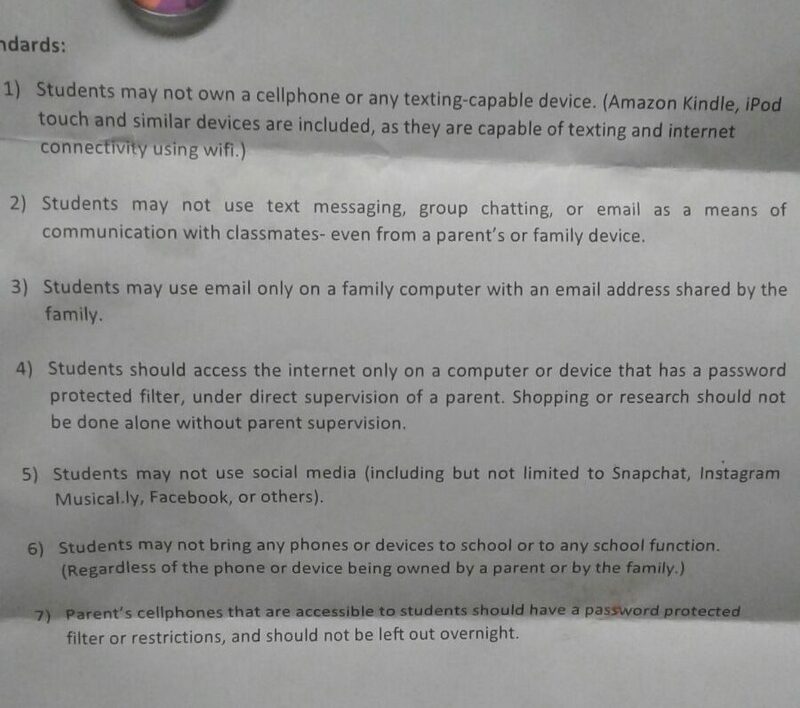 One school we know disallows students from smartphone and internet usage. 59. RT: Before purchasing a router – see if it has ample parental controls. 60. RT: Some router companies offer extra parental controls for a fee. 61. RT: Some routers offer a Smartphone app to be able to monitor the internet usage from the app. 62. GN: Don’t be quick to jump on the bandwagon for technology. See first if it is good for the spirituality, education and materialism of child. 63. GN: Discuss concerns with Torah educators, Rabbis, social workers and professionals. 64. RT: Limit IP and/or MAC addresses that can gain access to your router. This prevents people from accessing your router with an outside computer or device without your permission. 65: CP: In browser settings set your privacy and security level higher. 66: CP/RT: A firewall is a program that prevents unauthorized access to computer or router. Set up you firewall on computer and router to allow high protection. 67: CP/PH: In your browser download apps that will allow you more safe browsing. In phone look-up “appblock” or “applock” or “parental control” in playstore or appstore. 68. CP: Set site and search engine mode to “restrict” results. Google search allows one to restrict adult sites. Youtube also has a restrictive mode as well. 69. GN: Utilize several methods of parental controls at the same time (ie, redundancy), so if one fails to catch an improper site, the other will catch it. 70. CP: You should know how to unlock devices owned by children – to allow you to check up on what they are doing from time to time. 71. GN: You should also have access to their email – or at least put filters on their emails. You should have access to their unlock code to serve to prevent them from accessing certain sites. 72. Check Logs of internet usage. Some programs – like K9 and the router will give you a list of all the sites that were accessed. The browser also does this. By checking History – one can see all the sites that were accessed. Crafty children (or adults) may hide their sites by erasing history of sites visited on browser or by using privacy/secrecy/incognito mode on the browser. But the router also has a log of sites visited. So you might want to check that log of sites visited by accessing your router as well. 73. CP: Some browsers and programs will save your password when you log-on. This is called autofill. Avoid using autofill passwords – especially for the K9 (or other parental control program) administrative password, for administrative controls on the computer, for access to the router, etc. 74. CP: Block pop-up ads. Browsers usually have an option to block ads. Set the browser (or get an extension for browser) to block pop up ads. 75. CP: When a child gets a new phone, tablet or computer – before they use it – you should set yourself up on it as an administrator of the item – and set the controls to what is appropriate. 76. CP: Do not give easy access to children to your email or list of passwords. If they do have access – they might bypass certain restrictions on the computer. Thus it makes sense to put on several levels of parental controls. Some programs will alert you to unauthorized access attempts. Be informed. Everything in life has a price. It is up to us to weigh the pros and cons of limiting technology and the effect it will have on the future morality of the children and the family. This entry was posted in Children, Technology by admin. Bookmark the permalink.